* Kotobukiya's Frame Arms Girl line expands with Frame Arms Girl Architect! * Consisting of 200 pieces, Frame Arms Girl Architect is fun to build and display * Features multiple points of articulation, allowing for a wide range of posing options (some poses may require a display stand) * Architect includes multiple weapons and face parts, and all her parts are compatible with other Frame Arms Girl plastic model kits * Fully customizable! 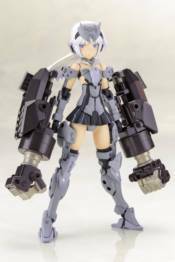 Use with other Frame Arms Girl armor, weapon, and model kit sets!